PITTSTON — The NEPA Alliance is a regional community and economic development agency serving the seven counties of Northeastern Pennsylvania including Carbon, Lackawanna, Luzerne, Monroe, Pike, Schuylkill and Wayne. NEPA Alliance services include business financing, government contracting assistance, international trade assistance, nonprofit assistance, transportation planning, research and information and local government services. • Business Finance Center: Eight loan programs, as well as the NEPA Business Finance Center. • Government Contracting Assistance: NEPA assists business clients in selling their products and services to all levels of government. • International Trade Assistance: Assists businesses to develop markets and generate international sales. • Nonprofit Assistance: Provides assistance to nonprofits organization and communities. • Transportation Planning: Assists PennDOT with transportation planning and programming services. • Research and Information: Provides research and economic impact modeling services to businesses, nonprofit and government agencies. • Appalachian Regional Commission (ARC): Provides technical assistance to organizations seeking ARC grant assistance. • Blue Ribbon Task Force: NEPA manages the community support group for the Tobyhanna Army Depot. NEPA Alliance has a strong economic and community development impact in Monroe and Wayne Counties. Below are a few projects NEPA is proud to have been part of. • Dec. 1, 2017: NEPA Alliance presents loan funds of $147,926 to Kariz Cutz, SBA 504 loan, through the NEPA Alliance Business Finance Corporation, for the purchase of land and a building in Monroe County. This loan assists Kariz Cutz in creating three jobs. Other project funds included assistance from Wayne Bank and cash from the borrower. Kevin Allen oversees Kariz Cutz, which was founded in 2010. Kevin graduated from barber school and became a licensed barber in 2003, when he began running his shop from his home for seven years before adding contracted barbers at the current location. Kariz Cutz was named the #1 Barber Shop in the Poconos in 2012 and has a great reputation throughout the community. Kevin has also used his passion to train five barbers who all currently operate their own shops in different locations. • Nov. 20, 2014: ARC Grant presentation to Northampton Community College. Northeastern Pennsylvania Alliance (NEPA) and Pennsylvania Department of Community and Economic Development (DCED) presented Northampton Community College (NCC) with a $100,000 Appalachian Regional Commission (ARC) grant to purchase equipment and supplies to support post secondary workforce development programs in the Information and Communications sectors. ARC funding was requested to revitalize, upgrade, and expand NCC’s education and training infrastructure through the purchase of software and hardware that meets technological standards in the workplace and allows new, returning and incumbent workers to compete in the technology marketplace. Equipment and supplies were purchased in support of the course objectives and student learning outcomes in the following programs: Computer Information Systems, Computer Science, Computer Aided Design, Computer Information Technology, Computer Maintenance and Service Technician, Web Development and Web Site Design. • July 17, 2012: ARC Grant presentation to Northampton Community College. Northeastern Pennsylvania Alliance (NEPA) and Department of Community and Economic Development (DCED) presented the Northampton Community College (NCC) with a $100,000 Appalachian Regional Commission (ARC) grant to purchase equipment and supplies for the Nursing, Allied Health, Biotech and Biology labs at the new Northampton Community College Workforce Development Training Center. The ARC grant for equipment and supplies will support the course objectives and student learning outcomes in the regionally targeted healthcare and biotechnology/bioscience programs. • Tobyhanna Army Depot: NEPA Alliance is the lead community coordinator that advises the community and business leaders regarding the value of the Tobyhanna Army Depot and its economic contribution to the Northeastern Pennsylvania region. NEPA purchased 42 acres of land to protect the depot from possible encroachment in December, 2011 and held title for five years. NEPA Alliance prepared an economic impact analysis of Tobyhanna Army Depot. In Fiscal Year 2016, the total impact within an 11-county region was an estimated $2.9 billion in economic impact. Tobyhanna Army Depot supported 11,875 jobs, which include 3,362 employees at the depot who reside within the region. The depot has an estimated $757.9 million in labor income. In 2014, Tobyhanna Army Depot launched a facility enhancement initiative which leveraged over $100 million in federal funds. In support of our war fighters throughout the world, the funds are used to ensure that the depot will remain a world-class facility for electronics innovation. During 2016, the economic impact in Pennsylvania from this initiative was $55.6 million. • June 1, 2018: Kitty Hawk Technologies Certification. Through a partnership with the NEPA Alliance, Department of Community & Economic Development (DCED), Wayne County Economic Development Corporation (WEDCO) and the Northeastern Pennsylvania Industrial Resource Center (NEPIRC), Kitty Hawk Technologies, a certified veteran owned small business, received its ISO 9001:2015 Certification through the NE Pennsylvania Transition Partnership (DTP). Completion of the certification allows Kitty Hawk Technologies access to new clients that cannot be currently approached without this certification. This certification will also aid in its market outreach efforts with both the Department of Defense (DOD) and Aerospace Industry. This project was funded by the Department of Defense’s Office of Economic Adjustment. 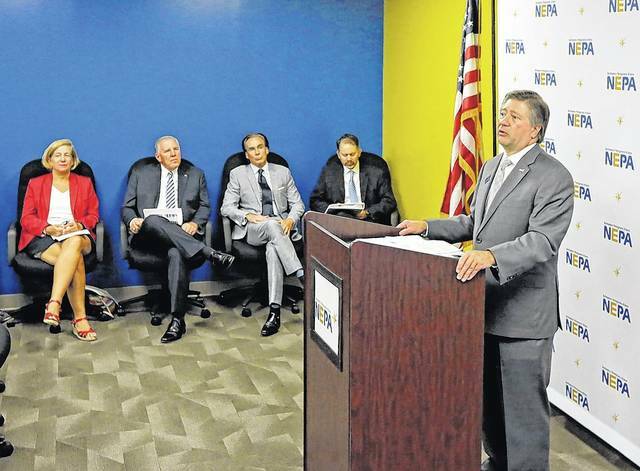 It was managed by the Pennsylvania Department of Community and Economic Development (DCED) and implemented locally by NEPA Alliance and key partners, Northeastern Pennsylvania Industrial Resource Center (NEPIRC), Small Business Development Centers (SBDC) and Wayne Economic Development Corporation (WEDCO). Mr. David Suhosky, President of Kitty Hawk Technologies presented awards to his staff for their assistance and dedication during the certification process. Jeffrey Box, President & CEO of the NEPA Alliance, acknowledged, “The DTP initiative is designed to provide support to DOD contractors and supply chain vendors that have been affected by decreased DOD spending.” He also noted that the NEPA DTP has secured over $3 million dollars to the region to support this initiative. Mr. 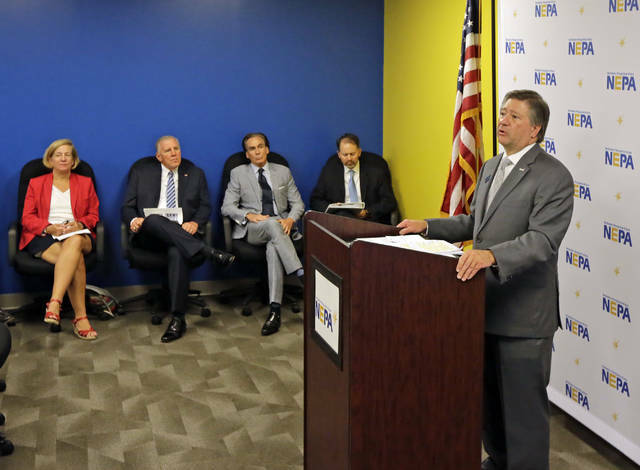 Box further stated the initiative has provided over $510,000 in vouchers to DOD contractors throughout the region, which leveraged $230,000 in private investments. Dale Parmenteri, Vice President, Consulting Operations for the Northeastern Pennsylvania Industrial Resource Center (NEPIRC), provided an overview of the ISO Certification process and its requirements. State Sen. Lisa Baker acknowledged the fine work the NEPA Alliance is doing with bringing the economic development partners together for job creation. State Representative Jonathan Fritz commented on a job well done for Wayne County. • January 25, 2017: Sutphen East Corporation received USDA Rural Development/NEPA loan.Through a partnership with the NEPA Alliance, Wayne County Economic Development (WEDCO) and Wayne County, Sutphen East Corporation received a $225,000 USDA Rural Development loan, through the USDA/NEPA Alliance Intermediary Relending Program (IRP), for the purchase of land & building in the Sterling Business & Technology Park, Sterling Township, Wayne County. This loan assists Sutphen East Corporation in creating 10 jobs and retaining 40 jobs. Other project funds included owner’s cash equity. Julia Sutphen Phelps oversees the Sutphen East Corporation, which was founded in White Lake, Sullivan County, N.Y. The Sutphen family has a rich history and dedication to manufacturing quality custom fire apparatus since 1989. Sutphen East Corporation sells its manufactured products, of primarily pumpers and tankers, based on customer specifications and needs. The ultimate consumer of the company’s products are municipalities and volunteer fire departments. • July 1, 2013: PREP Partners Combine Forces to Assist Lake Region Micro Electronics – Lake Region Micro Electronics Corporation was recognized on June 27, 2013 as a start-up business success story. The company took advantage of regional Partnership For Regional Economic Performance (PREP) resources and prospered through federal government contracting opportunities. The company, a small Woman Business Enterprise (WBE) certified with the Commonwealth of Pennsylvania, was formed in 2012 by Allison “Allie” Mancino, President and CEO. The company has been awarded approximately $62,000.00 in government contracts from the Department of the Army and the Defense Logistics Agency (Aviation) for items relating to electronic connector manufacturing and computer storage device manufacturing. Allison got her start at the Pocono Lake Region Chamber of Commerce where she met with The University of Scranton Small Business Development Center (SBDC) for assistance in the start-up of her business. Based on Allison’s business model, the SBDC referred her to the Northeastern Pennsylvania Alliance’s Procurement Technical Assistance Center (NEPA PTAC) to pursue the potential to apply for government contract opportunities. Allison was invited to the PTAC Government Contracting Showcase 2012. Shortly after the Showcase, Tobyhanna Army Depot awarded the company a contract which provided a start in the government contracting arena. 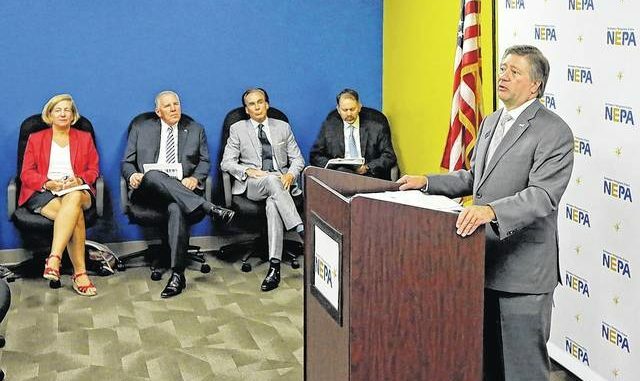 This story represents a successful collaboration in service to the business community by two Pennsylvania DCED PREP Partners, NEPA Alliance and SBDC, as part of the Partnership for Regional Economic Performance Program. • Feb. 15, 2013: NEPA Alliance presents USDA Rural Development and Economic Development Administration (EDA) small business loan funds to Antler Ridge Winery, Inc. The Northeastern Pennsylvania Alliance (NEPA) and USDA Rural Development presented Antler Ridge Winery, Inc. with a $115,000 combined loan to purchase land for a building. These low interest loan funds will allow them to expand their business.